On An Overgrown Path: How social is your media? How social is your media? No apologies for returning again to the vexed question of the BBC. Five orchestras, the BBC Singers, the Proms, the biggest new music commissioning programme in the world and a total classical music budget £51.6m are all controlled by the BBC. Which means that everyone involved in, or listening to, classical music in the UK is affected by the BBC, as are many others around the world. The uncovering here this week that the BBC was using beta software to monitor blogs, Twitter and other social media could have been embarassing for the corporation. But it was handled in exemplary fashion by the BBC's online and technology team who quickly and honestly responded to my story and explained what was going on. This response is consistent with my previous experience of the BBC technology staff; they work in an open and collaborative manner that contrasts sharply with some of their colleagues in programme making areas. 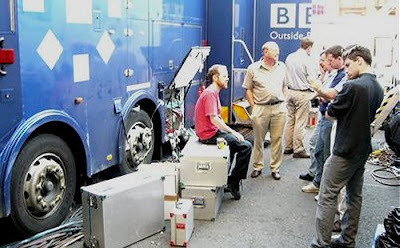 It is probably not a coincidence that the video about this blog and my adventures in internet radio made for the 2007 Cambridge International Radio Conference was commissioned via Nick Reynolds who is a part of the BBC technology team and edits the BBC internet blog. The Radio 3 blog is a place where the Controller of Radio 3 and Director of BBC Proms Roger Wright and some of his colleagues and guests will discuss Radio 3, the Proms, the BBC performing groups. If that description doesn't say it all, the fawning posts and lifeless comments on the blog do. Then there were last year's paid 'official Radio 3 bloggers', who were no more than carefully vetted Radio 3 fellow travellers. That one quietly fizzled out when their few readers realised the official blogs were just another PR platform for the station. Which leaves the Radio 3 messageboards; the posts on these rarely rise above the usual online nose picking so it is probably best they are hidden behind a 2 point type link at the foot of the Radio 3 homepage. BBC Radio 3's use of social media reflects the 'control freak' mentality currently prevailing at the station. Regular readers will be familiar with my account of the station's clumsy attempt to influence bloggers. Also documented here was my truncated appearance on a BBC Radio Five Live discussion of the Proms during which I was told that negative comments were not allowed as Proms director Roger Wright was not on the programme to answer them. (In which case why was I invited onto the programme?) Meanwhile the full agenda of Radio 3's new generation artist scheme and world routes academy are hidden from public scrutiny courtesy of the Freedom of Information Act exemption for information held by the BBC for purposes of journalism, art or literature. BBC Radio 3's senior management could learn an awful lot about openness and accountability from their colleagues in the online and technology departments. For their first case study they should read Roo Reynolds' disarming and winning response to my typically acerbic story about BBC Buzz. Then they should read the response channeled through a talking head to my similarly acerbic 2006 post which revealed a Radio 3 choral evensong broadcast as a fraud. I take it that the grammatical error in your headline was a satirical comment on Radio 3 standards? The easy answer would be to say, yes, of course it was a satirical comment. But it wasn't. So instead here is my version. How social are your media? may be grammatically correct, but it read clumsily in draft. So I scanned around and found some support for the argument that in this context media is making the transition via common usage from a plural to a singular noun in the same way that data has. So I ran with How social is your media? As ever, I'm prepared to admit I may be wrong, and I am happy to publish contradictory views. But, perversely, I do not accept that acoustics should be allowed to make the same transition! As I write on Aug 26 the most recent post on the Radio 3 blog is 19 Aug, the one before that is 09 Aug. Presumably we can expect the next post on 29 Aug?